The 7055000 Valve is a piston style, positive displacement metering head with two integral check valves to control the flow of material into and out of the valve. A simple check valve mounted to the metering cylinder acts as the inlet check valve and the front closing needle valve (chamber valve) acts as the outlet check valve. 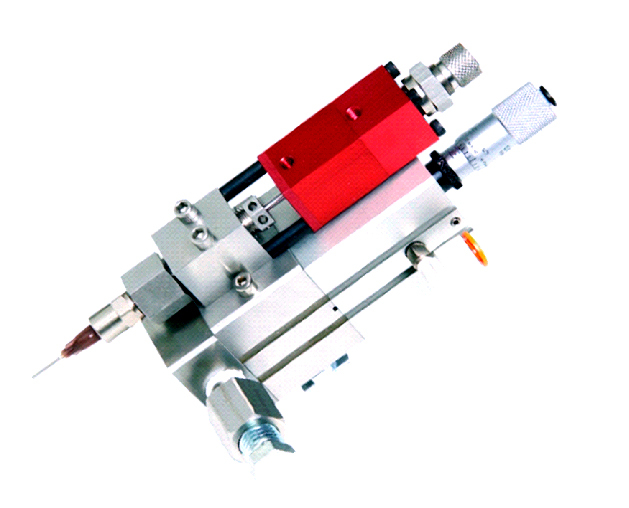 This valve is designed to dispense medium fluid volumes (0.10cc-1.45cc) with an extremely high degree of precision. The Metering Chamber houses a piston cylinder combination that is used to meter a specific amount of material to be dispensed. A micrometer adjustment in the upper air section controls how far the piston can travel thus regulating the shot size. Fluid pressure on the material inlet will push the piston upward until it reaches the micrometer adjustment. The Front Closing Valve portion of the dispense valve will stay closed while the metering chamber fills. The Front Closing Valve portion of the valve will stay closed while the metering chamber fills. Once filled, air pressure is simultaneously applied to the Front Closing Valve dispense valve to cycle it open and the upper air section of the metering chamber to force the piston down and dispense fluid through the valve. A check valve on the inlet of the metering chamber will force all of the fluid in the chamber to flow to the Front Closing Valve. Once all material has dispensed from the valve, the Front Closing Valve will cycle closed and air pressure will be relieved from the upper air section of the metering chamber so the inlet fluid pressure can again fill the chamber. The Front Closing Valve acts as the outlet check valve and controls the rate of the fluid flow out of the valve with a needle and seat combination. 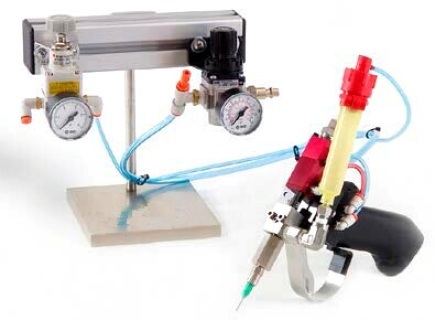 Fluid dispenses as the needle retracts out of the seat, then stops as the needle moves back into the seat. The stroke adjustment bolt in the air section of the Front Closing Valve regulates the distance that the needle can retract out of the seat thus controlling the orifice size and rate of fluid flow. The 7055000 requires a 2-position, 4-way air solenoid valve to actuate the air section. The valve should be operated with clean, dry air between 60-100psi. Two #10-32 threaded air ports are located on the air section of the FRONT CLOSING VALVE and one #10-32 port is located on the upper air section of the metering chamber. The port located furthest from the midsection of the FRONT CLOSING VALVE valve is air to close the valve. The port located closest to the mid-section of the Front Closing Valve is air to open the valve. The air supply connected to the mid-section of the Front Closing Valve should be tied to the air section of the metering chamber. Quick connect air fittings are supplied with the 7055000 to fit 5/32” tubing. Note: the valve should be normally in the closed position. Fluid is supplied to the 7055000 through the 1/8”mnpt inlet check valve located on the inlet of the metering cylinder. ​Availability: Can range from 2 - 4 week build time. Need multiple units? Contact IDS directly for a quote. If you have never used this system with your material, be sure to confirm compatibility. The 7055000 positive displacement valve Is intended for dot deposits or filling applications. This full system quote is intended to feed the valve from 55cc syringes, and includes the valve controller and a desktop stand. Requires 2 regulated compressed air lines, up to 100psi, each to function. Intended for high accuracy small to large dot deposits, even if the material thickens over time or changes in thickness from batch to batch. 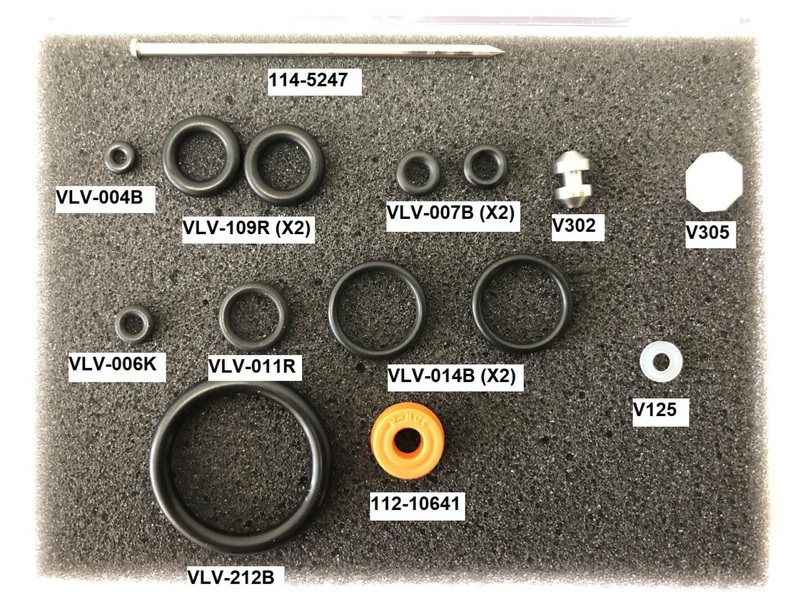 The 7055000-SP = Spare Parts Rebuild Kit for IDS 7055000 Positive Displacement Valve is intended to be used with the 7055000 valve only. Do not order for other versions of the metering valves. Restocking Fee Will Apply If Ordered In Error.